Most people know they should be eating around five pieces of fruit and vegetables a day. This is an important public health message – increased consumption of fruit and vegetables is associated with lower calorie intake, reduced obesity and a lower prevalence of several diseases (including certain cancers and cardiovascular disease). Diets rich in fruit and vegetables are also associated with better cognitive performance in children, as well as greater psychological health and well-being in later life. However, whilst many children will happily consume a range of fruit, getting children to like vegetables can be a real struggle for many families. Although people tend to group fruit and vegetables together when they talk about a healthy diet, getting children to eat vegetables tends to be the greatest challenge for many families. Fruits are naturally sweeter than vegetables and are more readily accepted because children naturally favour sweet foods. Breast-milk is sweet, and from an evolutionary perspective consuming sweet foods is beneficial for survival when food sources are scarce. When babies are first introduced to foods other than milk, many parents report that children are open to new tastes and will readily accept most foods. However, at around 18 months of age many parents start to see the signs of food neophobia (‘fear of new foods’). Many researchers believe this is an adaptive response that developed to prevent children from consuming toxic substances when they start to crawl. This avoidance response tends to be elevated for bitter foods, which makes sense because many toxic foods are bitter to taste. Unfortunately, many vegetables are also bitter. Although this does appear to be a developmental stage that children pass through (neophobia gradually declines by around five years of age), eating behaviours can become entrenched and some children continue to have very restricted diets in later childhood. Many caregivers describe their children as ‘fussy eaters’ who have limited dietary variety. Less than 10 per cent of UK children eat the recommended levels of fruits and vegetables. Although parents are bombarded with information about what children should eat, practical and evidence-based advice about how to help children to like new foods tends to be scarce. So, what do we know about how best to promote acceptance and liking of new foods such as vegetables? What can parents and families try in the home? When it comes to getting children to like new foods, exposure is key. Psychological research has demonstrated that repeated exposure to new foods is crucial for eventual acceptance. Children tend to like foods that are familiar; the foods that they are used to and are offered to eat regularly. Even during pregnancy and breast-feeding the flavours that children are exposed to can determine taste preferences in infancy, and research suggests that exposure to vegetables early on during weaning can predict greater vegetable acceptance in later childhood. Early research by Leanne Birch and colleagues showed that during the first year of life children often only need one exposure to a new food to double their consumption of that food. However, for children in the neophobic stage it can take up to 15 exposures to a new food before children will accept those foods into their diets, and it is likely that the number of exposures required will be greatest for bitter vegetables. This can be disheartening, expensive and time consuming for families, and most parents report that they will only offer a child a rejected food a few times before assuming that the child does not like the food. An added complexity about repeated exposure is that it matters how foods are exposed to children. There is a wealth of evidence showing that pressuring children to eat new foods is counterproductive and results in a lower liking for those foods in the future. This was very nicely demonstrated by Amy Galloway and colleagues in a study where a researcher sat with two groups of children whilst they consumed soup. With one group of children the researcher said ‘Finish your soup, please’ four times during five minutes, whilst in the other condition the research did not say this. The children in the pressured condition not only ate less of the soup, but they also made more negative comments about the soup, such as ‘Yuck, I don’t like it’. Whilst the evidence shows that pressuring children to eat is not effective for long-term liking, we are starting to understand how parents can repeatedly expose children to novel or disliked foods in ways that support eventual tasting and liking. Children learn by example. Watching other children, adults or ‘characters’ enjoy new foods (i.e. positive modelling of food intake) can make children more willing to try them. Modelling eating and liking a food is likely to increase consumption in children through observational learning, and this may be one reason why many children are described as less fussy at nursery or pre-school compared to when they are at home (Grimley & Farrow, 2018). Some teachers will put more fussy children with friends who are ‘plate-cleaners’ and this can be very effective at encouraging fussier children to try more foods. However, modelling can also have detrimental effects if children see other children reject new foods. Such negative modelling can be very difficult to reverse, even when positive modelling is used. In several studies (e.g. Greenhalgh et al., 2009) peer models who like to eat vegetables have been shown to be effective, with young children being more willing to consume vegetables if they view peer models eating them. The Food Dudes (http://caer.bangor.ac.uk/research/food-dudes.php.en – and see also The Psychologist, January 2003) is a good example of this: a successful intervention that increased children’s fruit and vegetable intake by using images and videos of child characters who like and prize vegetables. However, parents can also take advantage of the effects of modelling at home, and several home-based interventions have shown that children are more willing to taste a new foods when parents show children that they eat and enjoy it. Several studies have demonstrated that using one food as a reward for eating another food is not an effective strategy to facilitate liking. The bribe ‘You can have some chocolate if you eat your broccoli’ may result in a child gobbling down their broccoli to get chocolate, but this is unlikely to foster a love for broccoli in the long term. Indeed, broccoli is likely to be perceived as a punishment that the child has to endure to obtain their chocolate prize; such strategies likely engender preferences for sweet foods and lower the intrinsic value of healthy foods. So, one food should not be used as a reward for eating another food, but there is growing evidence that small non-food-based rewards can be effective at encouraging children to taste vegetables. Non-food based rewards can include tangible rewards such as stickers or other small rewards, or verbal rewards such as praise (‘What a good taster you are’). Evidence suggests that these types of rewards can be very effective at getting children to taste novel or not well-liked vegetables. In a 14-day intervention study we published with Clare Holley in Appetite in 2015, where we compared the effectiveness of these three different strategies (repeated exposure, modelling and rewards) over 14 days in a parent-led intervention at home, we found that the greatest increases in liking were seen in children whose parents used a combination of rewards, modelling and repeated exposure. Reward-based motivation may be most effective when conducted away from meals; mealtimes with young children can be stressful and have often become the place where food is refused and battles start. Setting aside quiet time for ‘food adventures’ outside of mealtimes seems to be a more promising way to encourage children to try new foods, and home-based interventions such as Tiny Tastes have been developed to support parents with the reward based approach (see www.weightconcern.org.uk/tinytastes). Researchers have also begun to explore the potential for non-taste methods of increasing child liking of novel or disliked foods. Sensory game-based interventions have been used in the community to help support families who seek to reduce fussy eating. Anecdotal reports suggest that ‘messy play’ games with foods can be very effective at reducing fear and increasing willingness to try new foods. Such games are often focused around playing with foods to lower anxiety and reduce fear about new foods (e.g. making pictures with food, playing bingo with food). Activities that promote multisensory exposure and teach children awareness and knowledge of the characteristics of foods via growing, cooking, shopping and tasting have also been shown to be effective at promoting liking for new foods. For example, if children cook or grow a food, they are more likely to taste it; and allowing children to play bingo with real foods has been shown to increasing consumption (Coulthard & Ahmed, 2017). It appears that the positive experience of cooking, growing or playing with food may generalise to the foods themselves. In our increasingly digital age the games that many children play are often on electronic tablets. Serious games (games that have a purpose) are low cost and intrinsically rewarding for the player. As 87 per cent of adults aged 25–34 own a smartphone in the UK, the majority of parents already have access to apps. Moreover, many nurseries and schools now widely use tablets as educational devices. Research indicates that most young children are computer literate, with UK children under the age of five using apps for an average of 80 minutes a day. Although app usage in children should be supervised and controlled, there is clear evidence that educational apps can help young children’s skills around letter and phonics recognition, as well as with counting and numbers. Less research has explored the potential psychological benefit of apps for young children, for example around eating behaviour, but we do know from studies led by Phillippa Heath that visual exposure to vegetables via picture books has been linked to greater consumption of vegetables. 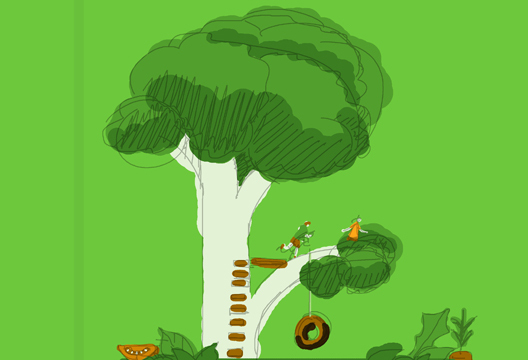 With support from the British Psychological Society, and our team of collaborators, we have developed Vegetable Maths Masters, an app for young children that allows them to play fun maths games with vegetables. Children can choose from a range of six children or characters to play with and can draw with vegetables, count with vegetables, add with vegetables and play a range of different maths games with vegetables. All of the games relate to visual mathematics: drawing numbers, counting, adding and subtracting, sharing and times tables. The app embeds a range of the previously mentioned psychological factors that have been shown to support acceptance of novel foods in children. These include repeated exposure to new foods, seeing other people eating and enjoying new foods, and offering tangible rewards for playing with new foods. Foods are visually represented with realistic images of vegetables that are not abstract from their actual form, as in many food-related apps for children. Instead, repeated exposure to vegetables via these realistic images allows children to recognise them when they see them away from the game. We also draw on modelling in the game: children choose a character to play with and throughout the game they see this character eat and enjoy vegetables. The game also utilises tangible rewards as children collect stars when they complete tasks correctly which they can then use to buy animated vegetables in a virtual shop – Chloe the Carrot, Bertie the Broccoli, Polly the Pea and Sam the Squash. As children earn stars they can buy shoes, clothes, hair, glasses and other accessories to decorate these vegetables. This adds a sense of reward for completing games correctly and also motivates continued use, which aligns with the evidence surrounding the importance of repeated exposure to increase familiarity. Initial feedback on the app has been overwhelmingly positive, and we are currently testing the efficacy of the app to increase liking of the vegetables that children play with. Birch, L., Gunder, L., Grimm-Thomas, K. & Laing, D. (1998). Infants’ consumption of a new food enhances acceptance of similar foods, Appetite, 30(3), 283–295. Greenhalgh, J., Dowey, A., Horne, P. et al. (2009). Positive- and negative peer modelling effects on young children’s consumption of novel blue foods. Appetite, 52, 646–653. Grimley, C. & Farrow, C. (2018). Are children really less fussy with food at nursery compared to at home? European Heath Psychology Bulletin, 20(1), 425–431. www.vegetablemathsmasters.co.uk (free to download via iTunes and google play).